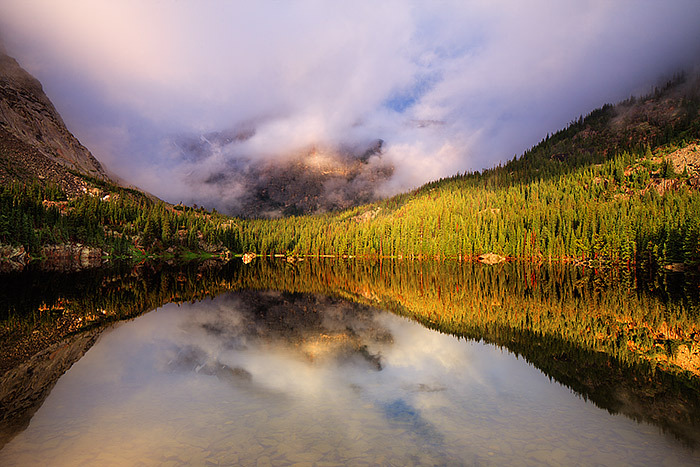 Heavy rains fell all through the night over Loch Vale in Rocky Mountain National Park. The weather calmed, the rain stopped and the sun begins to break through the cloud cover on a beautiful morning at The Loch. Sunlight spotlights the Cathederal Wall on the far end of the lake as clouds swirl. The aroma of pine weighs heavy in the air as the occasional trout breaks the smooth surface of The Loch. Photo © copyright by Thomas Mangan.